1I think some people are surprised to know that a minister teaches at a business school. How do these lessons translate to business? 3You are just finishing up a sabbatical before you return to lecture at Stanford Graduate School of Business. How did you spend your time off? What will you teach at Stanford GSB? 5Which biographies are on your short list? 7What are some ways people can integrate religion into their work lives? 8What lessons does literature offer to the contemporary workplace? 10Name a CEO who is successfully bringing his or her spirituality to work every day. Before retiring last year, Scotty McLennan spent 14 years as the dean for religious life at Stanford University, where, among other things, he interviewed the Dalai Lama and worked to create a campus meditative center, which opened last summer. As he returns to teach at Stanford Graduate School of Business this spring, the Unitarian Universalist minister sat down to discuss the benefits of quiet reflection, and why people do not need to check their religion at the door when they go to work on Monday morning. When visiting Windhover contemplative center, which you had a key role in creating on the Stanford University campus, I noticed that some visitors could not help but chat with each other, and one was even texting on her mobile phone. Why is it so difficult for us to be still, even in a center intended for that purpose? Windhover is meant to be a technology-free zone, knowing that our mobile phones and other electronic devices can not only be addictive, consuming our attention, but also can keep us tense, stressed, and even unable to relax and sleep, as much current research is showing. They can also be disturbing to others. Of course we’re social beings, so chatting with each other and chatting online are normal and routine. But meditation is meant to break the normal and the routine in service of radically expanded breadth and depth of experience, of enhanced awareness, of mindfulness. It’s not easy, though, and it takes discipline, precisely because it takes us far from our normal and routine life. You actually have to sit still and do nothing. Ideally, you have to concentrate on only one thing, like following your breath in and out, rather than being scattered and consumed by many things. It is hard for me to imagine that you, while a student, who played ice hockey in high school at the Hotchkiss School in Connecticut (and was on the freshman and club hockey teams at Yale) would be able to stay still during meditation. I was an activist in many ways — physically, intellectually, politically, spiritually. But learning how a great activist like Gandhi found his strength in quiet meditation helped me try it out, and the Hindu priest I lived with one summer in India insisted on it as a daily exercise. Practice makes perfect. Or makes it easier, since it’s certainly never been perfect for me. becoming slower to anger, breathing intentionally when I feel stressed, feeling connected to the larger universe or Ultimacy. Meditation is a central practice for many Buddhists and Hindus, and we in America often attribute it to traditions other than Judaism, Christianity and Islam. handling prayer beads, rocking rhythmically, mental visualization, muscle relaxation, contemplating nature, and enjoying art, to name a few techniques and methods. No one has a lock on quietude, reflection, stillness, and serenity. I think some people are surprised to know that a minister teaches at a business school. How do these lessons translate to business? Business people spend the majority of their waking hours at work, and many of them want to find it meaningful. Many also want to conduct their business affairs ethically, and most of us worldwide learn our ethics through our religious traditions or through philosophical understanding of morality that we inherit from our families, education and surrounding culture. I wrote a book with a colleague at Harvard Business School where we tried to help readers integrate their spirituality and ethical commitments with their daily work lives. Ultimately, I believe this leads to more successful businesses and to greater satisfaction of customers and other stakeholders. 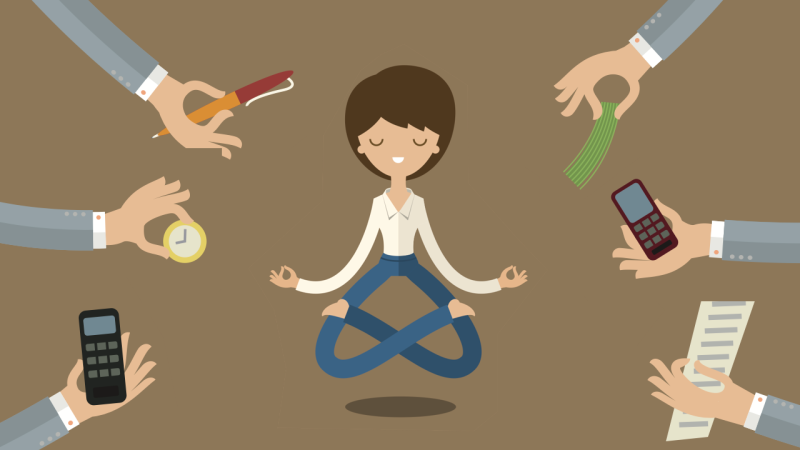 There seems to be a renewed interest among business people to make space for finding their inner calm, such as through the practice of mindfulness. But how do you convince CEOs and other high-achieving leaders that it is a worthwhile thing to do? It doesn’t take much to convince business leaders and others that they should take a coffee break from time to time. Taking 10 or 15 minutes off ultimately increases productivity rather than decreasing it. How much more useful and fulfilling to stimulate one’s “relaxation response” through a meditational or prayer practice during one of those break times. If nothing else, there’s good medical evidence that it helps you to reduce stress, limit negative emotions, lower blood pressure, restore calmness, and increase your overall sense of well-being. You are just finishing up a sabbatical before you return to lecture at Stanford Graduate School of Business. How did you spend your time off? What will you teach at Stanford GSB? I’ve used my leave to travel and write and explore areas of interest that I’ve had for a very long time but not been able actively to pursue, like listening to classical music, spending time outdoors in nature, learning about digital photography, watching great movies, and catching up on developments in constitutional law. And I’ve been developing two new courses. One is tentatively titled “Business Biography: Finding Spiritual Meaning at Work.” We’ll look at biographies of respected people in business to see how they integrate what ultimately really matters to them with their business careers, and how they fail in this regard. In the other course, I want to help students understand the etiquette of doing business in quite different cultures: say, Japan, China, India, Egypt, Israel, Russia, Brazil, and Great Britain. They will learn about the deeper cultural ethos from which that etiquette emerges, and finally be introduced to the dominant religious traditions which I believe underlie both etiquette and ethos.